Five Horizons: What's New for December '96? Thur Dec 26, 1996: Happy Kwanzaa! Wed Dec 25, 1996: Merry Christmas! Mon Dec 23, 1996: Happy Birthday, Eddie Vedder! Added a link to today's LA Times interview with the band by the always excellent Robert Hilburn from the news page. Sat Dec 21, 1996: Happy Solstice! Grab a soundbyte of PJ's "Let Me Sleep" from our temporary holiday greeting page. Added Eddie's two December (surprise) appearances in Rome to 1996 concert chronology. After reporting to expect a delay this year, the Ten Club now says that there will be a Christmas single! Check our news page for more details. Thur Dec 5, 1996: Happy Chanukah! 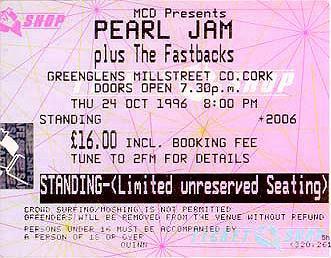 Added Dan Grenough's scans of his Cork ticket and photo of the Irish tour poster to the memorabilia page. 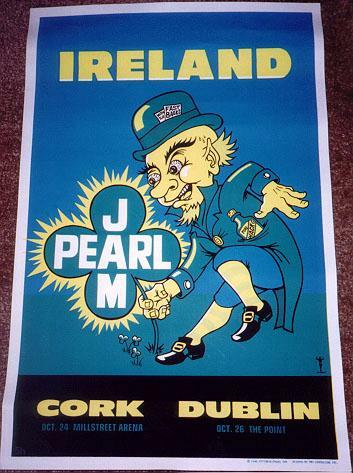 Dan also wrote down the setlist for the Dublin 10/26/96 show he attended, which we've now added to the European leg of the 1996 concert chronology. Thanks, Dan! Added Ignasi Renom's wonderful review about his experiences surrounding the Spanish and Portuguese shows. The 1996 video guide has been updated, and Five Horizons is proud to present (drum roll please...) video captures! =) That's right folks. Chris has a new toy, and now you can not only read about videos from the '96 tour but you can see what they look like as well!